Two foods are being recalled for undeclared allergens. Pumpkin Pesto Tapenade is recalled for undeclared walnuts, or tree nuts, and chicken thighs are recalled for undeclared wheat and soy. No allergic reactions have been reported to the company to date in regard to the chicken thighs, but one allergic reaction was reported in association with the pumpkin pesto tapenade. Deleite Foods of Salt Lake City, Utah, is recalling marinated chicken thighs for undeclared wheat and soy. About 11,000 pounds of that product is recalled. The product was produced and packaged on October 12, 15, and 16, 2018. The recalled product is 30 pound cases each containing 3 10-pound bags of frozen “Marinated Chicken Thighs Meat Diced – SUPC 7009466”, with lot codes 101218, 101518, and 101618. The product has the establishment number “P-46130” inside the USDA mark of inspection. The chicken was shipped to restaurants in Utah. Nor Cal Food Solutions is recalling 567 cases of The Purveyors Kitchen Pumpkin Pesto Tapenade for undeclared walnuts, or tree nuts. The product was made by Foodie Tout Inc, doing business as Purveyors Kitchen. The tapenade was distributed at Purveyors Pantry in Nevada City, California, and Cost Plus – World Market in Stockton, California and Windsor, Virginia between July 2017 and November 2017. 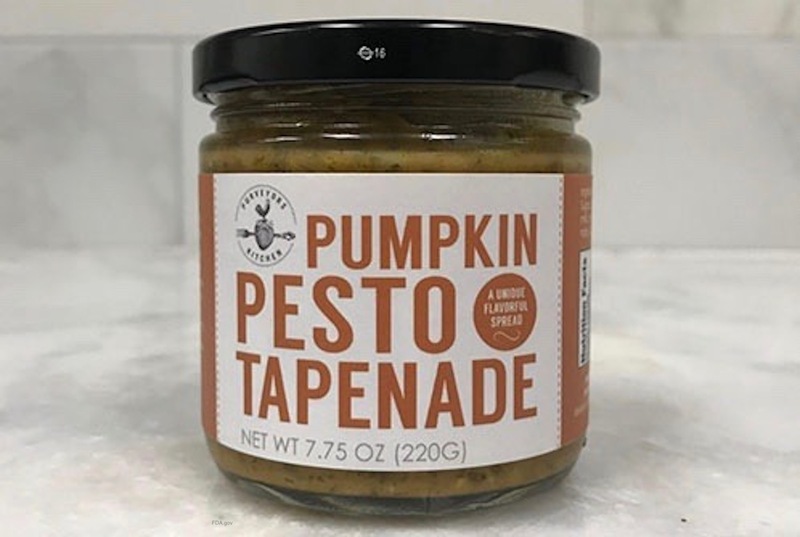 The recalled item issued Purveyors Kitchen – Pumpkin Pesto Tapenade in 7.75 ounce glass jars with a metal lid. The The product is a light brown / orange color with pieces of basil and walnuts in it. The lot codes being recalled are PKPP17179A, PKPP17179B, and PKPP17179C, with the expiration dates of June 2019; and PKPP17230B with the expiration date of August 2019. If you purchased either product and are allergic to the respective ingredients, don’t eat it. Throw it away or take it back to the place of purchase for a refund. More traditional pestos are made with pinenuts. Because of the new propensity to use walnuts instead, I cannot consume it and I always have difficulty when at a restaurant asking if their pesto is made with walnuts. This is an important warning.